Chemical manufacturers have very specific needs when it comes to maintaining and cleaning their equipment and facilities. Acquiring the tools needed in the cleaning process and enough employees to perform this wide range of tasks can cost significantly more than simply hiring a qualified local vendor. Outsourcing cleaning services to a skilled industrial cleaning company can save time, money and headaches. It can be a challenge looking for industrial cleaning for chemical manufacturers because of the hazardous nature of the material that they work with and ultimately manufacture. The use of harmful products and chemicals can contaminate buildings—creating unsafe working conditions for workers and guests alike. It is crucial for chemical manufacturers to find a specialized commercial industrial cleaning specialist that has the experience and trained workforce equipped to work in this type of environment. 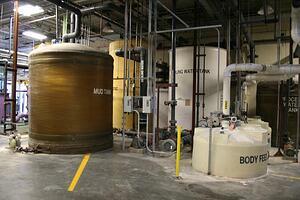 Cleaning a chemical manufacturing facility is not the same as cleaning a non-hazardous manufacturing facility. These sites are usually filled with acids, corrosives and/or flammable materials and a wrong step can cause catastrophic problems. Cleaning companies must be able to safely handle the hazardous chemicals and by-products created in the manufacturing process. A qualified industrial cleaning service that is capable of cleaning a chemical manufacturing facility should be hazardous waste certified. Hazardous waste is generated not only in the manufacturing process, but more often than not in the cleaning process. Your vendor must be able to not only clean your facility, but they must be licensed and qualified to dispose of the hazardous waste streams generated during the cleaning process such as the wastewater contaminated with the cleaning agents and residual chemicals. A qualified cleaning specialist should be equipped to provide pressure washing and decontamination services and be able to vacuum pump wastewater. Industrial tank cleaning is also an important component of your cleaning needs so be sure that your company is skilled at cleaning your tanks for scale, sediment and crystallization. Look for companies that use bio-degradable cleaning agents when possible to avoid adding to your hazardous waste streams. Make sure to get an estimate of the work to be performed. Depending upon the type of work, it may involve a pricing structure that is customized to your facility and equipment, the square footage or the amount of work that needs to be done. Most commercial cleaning services that handle this type of work will provide free estimates and may also offer a contract for services. Verify that your selected vendor has the necessary insurance documents to cover its employees and the work being performed, and make sure that they have the proper state and federal licensing including EPA, DTSC (State of California) and Department of Transportation to handle any hazardous waste created in the cleaning process. Verify both workers compensation and general liability, along with a list of at minimum three valid references.